The day started off with a presentation of our Gypsy Vanner stallions. Sir Maverick – Offered for sale and is in hunter/jumper training with Matt Lawson and gave a wonderful demonstration at the event. Dreammaker – another one of our talented Gypsy Vanner Stallions who is in training as well. He’s training and competing in driving events with Ashley Jenkins. Watch for the Dreammaker in the Veteran’s Day Parade in Knoxville, Tennessee on November 11 at 10:45 am. Gentleman Jack – Our youngest breeding stallion who will have his first foals on the ground in 2011. We’re excited to see what this beautiful black stallion produces when crossed with our mares! BeesKnees – This charismatic stallion is famous in Wales and we’re extremely pleased with his first US born Gypsy Filly – LexLin’s Brilliance. Watch for many more of his foals to arrive in 2011! BeesKnees is enjoying the fall and winter out in the pastures with his mares. The Midget – a well built and well known Gypsy stallion that gave us some outstanding foals in 2010! His last foal of the season Heavy Metal is particularly stunning red and white colt! Geronimo – Our newest breathtaking stallion to arrive from Wales. We’re anxiously awaiting the arrival of his first US foals next spring and the addition of his bloodlines to our gypsy horse herd! Reserve one of his 2011 foals in utero today! The Producer – aka the Buck Horse, 25 Grand Horse, Kent Horse and so on as he is known around the world. This Gypsy Vanner stallion is loved by all at LexLin and continues to produce outstanding offspring with his correct conformation, color and most of all his level headed and trainable nature. He was presented at one of the first GHVS Inspections this year and earned his 5 star rating by the judges. Following the stallions several of the Gypsy foals we’ve been blessed with in 2010 were led out for the crowd to inspect and admire. This foaling season went extremely smoothly and we were blessed with many exceptional Gypsy fillies along with a few colts. 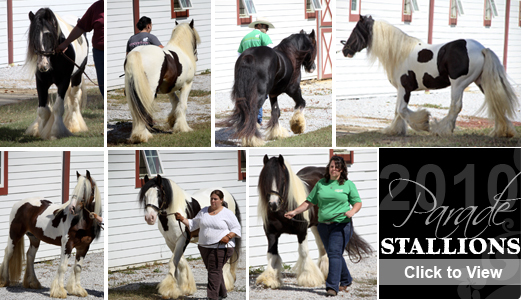 In 2011 we’re expecting 60+ Gypsy Vanner foals out of our mares. Ask about reserving a 2011 foal in utero to ensure the best price and priority in selecting a quality Gypsy Horse at an extremely reasonable price! Inquire about the terrific holiday financing and specials that are going on between now and New Years! Check back tomorrow and every day this week for recaps and photos on more of the happenings during our LexLin October 2010 Gypsy Horse Open House.